Make pie crust as usual. Roll out pastry, place in pie plate and trim to 1/2 inch overhang. Roll the overhang over so it is flush with the pan lip. Flute as desired, making sure it stays well on the rim of the pie plate to eliminate shrinkage. Refrigerate for one hour or freeze for 20 minutes. A well chilled pie crust holds it’s shape better on baking. Move the an oven shelf to lower middle, making sure there is plenty of room above (to accommodate the foil or parchment.) Preheat oven to 425 degrees at an appropriate time. Carefully line the pie crust with a sheet of heavy foil or a piece of parchment. (The edges should go up, not be folded over the edge of the pie crust) fill with beans or pie weights. Bake for about 12 to 15 minutes until the edges just begin to turn golden brown. Remove from oven and remove foil (leave oven on) by slowly and carefully gathering it up toward the center. If it seems to stick and pull away the pie crust, place back in oven for a minute or two longer. 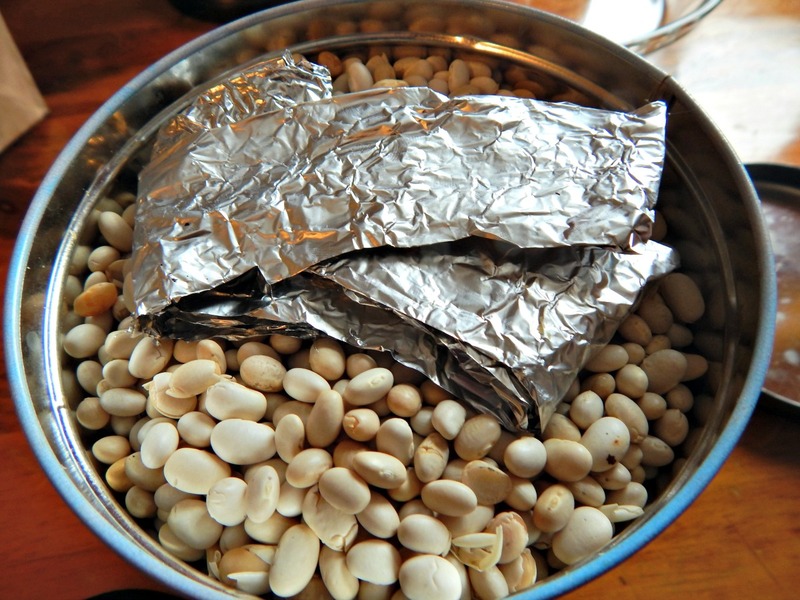 Place foil and screaming hot beans in a repository like a large bowl or another pie plate. Return pie crust to oven. For a partially cooked pie crust, bake until the bottom looks dry and flakey, just a few minutes. For a fully cooked crust, bake until the bottom turns golden brown. You will most likely need a pie shield when working with a blind baked crust – you’ll need one to make sure the top edges don’t get too dark before the bottom is done if you’re fully cooking or before your pie is done if making something like a quiche or pumpkin pie. Many recipes will say to use a shield “if needed” and you’re stuck last minute trying to drape pieces of foil over your pie. Do one ahead of time, trust me on this! I make mine out of aluminum foil before I put the crust in the pie plate. They can be bought but are a little awkward to store, and my home-made works beautifully and folds up right in the container with my pie beans. Keep home-made pie shield in with beans. With very little measuring skill and an interest in being frugal, the easiest method I’ve found is to make the pie shield before any baking is attempted. Simply place a sheet of foil over the pie plate – the foil should hang over about two inches on all sides. Press it down so the markings from the edges of the pie plate show, then fold over triangles of the foil so that there is a double edge and the edge hangs over the outside of the pie plate by about 1/2 inch and overlaps about a half-inch on the inside. If the original demarcation from the pie plate is not clear, repress. Using a scissors, cut out the center, making sure to leave the 1/2 inch overhang towards the middle. Straighten the shield out and have ready. It won’t be beautiful, but it will work. This entry was posted in Click here for Fabulous Food Posts and tagged Frugal Hausfrau, Pastry, Pie, Pie Beans, Pie Crust, Special Occasion. Bookmark the permalink. I’ll definitely be trying this soon though!! You do beautiful pastry – I don’t make many pies, so every Thanksgiving I get little butterflies as I set everything out to make it! This method is good for pumpkin because it keeps the pumpkin pie crust from having that wetness it can get sometimes. It also keeps it from bubbling up in the oven! Just to fill the other readers in, Ginger and I have decided to try a German recipe – She would make the traditional German version and I would make a recipe that has morphed into an American style. We’re kind of “brain storming” on what recipe to choose! I’m very excited and know it will be a challenge as Ginger is an excellent cook – an artist really, and it sounds like such great fun! I’ll have to give blind baking another try – my pastry always sinks down at the sides and leaves me with a horrible looking rim! Will try the refrigerating! My rims are NEVER the best, but I do press the dough pretty hard into the rim and try to make sure at least some is hanging over the top edge of the pie plate when I flute. And the cold dough really does help a lot! It lets you take the foil and pretty much press it towards the flutes (only towards them, almost kissing the fluting, not actually into them) without them becoming misshapen. Then fill to the top with the dried beans. You can actually put the dough into the freezer until it’s rock hard, too – then it’s indestructible. That gives you a lot of time to fuss with the foil and beans and still be very cold by the time it goes in the oven. I’m laughing! I should have challenged you to a cream pie with a blind baked crust! 🙂 Is there a traditional German cookie that has a date filling? My grandmother made these date filled cookies that I’d love to try out. I haven’t had them since she passed away in 1986. She made Spritz, too, but there is not much room for variance there! I have tried blind baking with pie weights and ended up with a soggy/wet looking crust when I removed the foil. I kept baking waiting until it looked done until the edges started getting too brown while the bottom was still unbaked.. I’ll stick with just pricking the crust well with the tines of a fork in the future as my mom used to do. It’s a very fine line, to be sure, when removing the weights. I sometimes prick, but every now and then i have the problem of pricking it just a little too deep or moving the fork too much and the custard has seeped through the holes a little bit. I guess it comes down to which method works well for each individual – I’m sure my “pricking” would improve with more practice and a lighter hand!